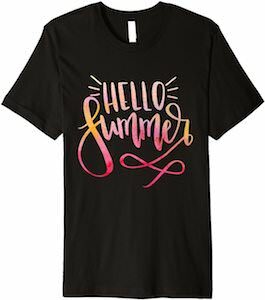 If you are looking for something to wear this summer then you should check out this fun hello summer t-shirt. You can get this summery t-shirt in styles for men, women, and kids and it comes in different colors and lots of sizes so that you will have the perfect t-shirt. On the shirt it shows in fun color the text “Hello Summer” and there are fun lines on it to so that it really feels like summer. Now you can just go out in the sun and show how much you like summer.